1. Place all ingredients in medium saucepan with some water and bring to a boil. Cool. 2. Place thawed turkey in 5 gallon bucket or whatever you are using. It needs to be deep enough to partially submerge the turkey in brine. If you are using a turkey pan cover with plastic wrap and turn every couple hours. Add in brine concentrate and gallon of water. Cover and chill(fridge or in garage, if cold enough). Brine the turkey for 12-24 hours. When it is time to cook the turkey, remove the turkey from the brine, rinse and pat dry with paper towels. Slide a small spatula or your hand between the skin and the meat(breast and thighs) to separate them. Insert half the herb butter mixture(recipe below) under the skin and spread evenly. Rub the remaining herb butter on the outside of the skin. Loosely tie the thighs together with butcher twine, season with salt and pepper. Place in pan and loosely cover with tin foil. 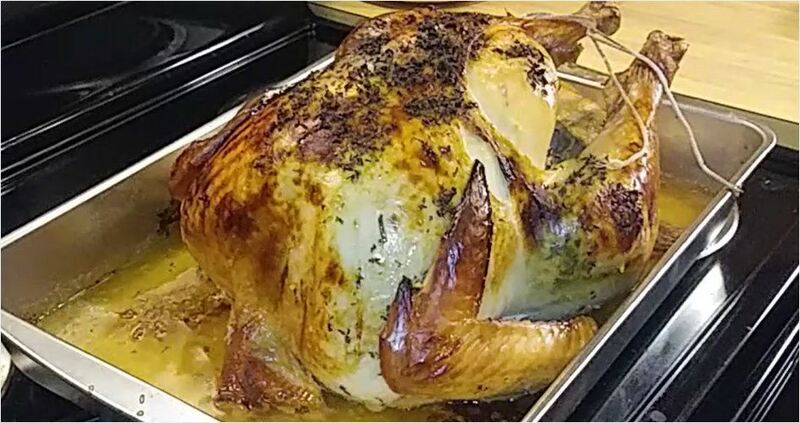 The tin foil helps retain moisture while cooking, the tin foil can be removed the last 45 minutes or so of cooking so the skin can get brown and crispy. Baste as desired. Bake at 350°F. Begin to check for donenees 45 before suggested cooking time. When done remove from pan and let rest 45 minutes-1 hour before carving. Finely chop all herbs or put in food processor to puree them. Mix all ingredients together. Pastured turkeys are know for cooking faster, even more so if you have brined it, then conventional turkeys. Monitor closely with a meat thermometer. The thickest part of the thigh should be about 160-165°F.